Reframing, reclaiming and revisiting menarche for women of all ages has such a potent healing capacity. I see it over and over again with women attending my ceremonial circles. They come with a heavy load, often energetically being dragged behind them. The baggage may be physical or emotional, however it shows up, it is exhausting to drag such a thread along trying to function and keep it together, to be 'normal' - what ever that may be (FYI there is no such thing, normal is a total illusion). Some are conscious of this weight, others less so. Either way the day helps women come together and unpack what was lacking at this important threshold, the maiden who was so sensitive and permeable at the time of first blood takes on all that orbits her at this foundational time whether posititve or negative. It sets the tone on how the rest of their feminine life unfolds and affects self esteem, confidence, appitude and self belief. It impacts many aspects of life women dont actually realise initially! Many women write before hand, nervous of being in circle, anxious of their woundings being seen or judged for what ever reason. Sometimes it is just part of the process and being witnessed in circle is part of the healing balm, being seen in the loving transformation by others helps validate and hold the power of the moment. Other times there is much that a woman with deep wounds or trauma needs, and it can be too painful or trixy to be in circle. One to one menarche work enables women to really visit parts of their psyche that they perhaps would feel limited or restricted in shining a light on in a group. Many times women wish to join a circle but the dates never tally or the geography is too great so working via skype opens up all possibilitites for healing. It is actually an intimate process, which at the inception of this way of working, through the ether via skype for me in the Menarche process I was unsure. However the many women who have I have walked alongside on this journey have found it to be personal, powerful and hugely transformative. We meet intially to discuss the process via skype and get a sense of the story or experience needing to be met in the unforlding of the Menarche process. There are then prompts and questions sent to help unravel the years of patterns, challenges or health issues. 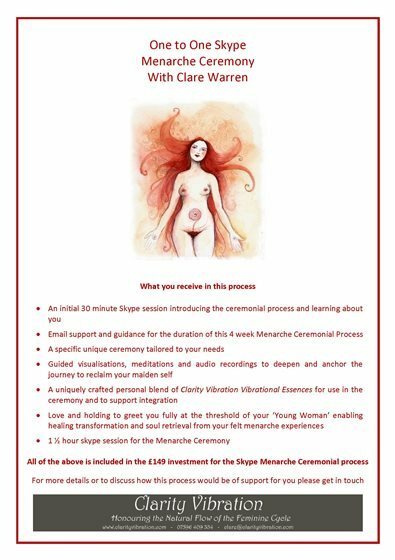 During the 4 week process we remain in contact via email and you receive guided visualisations, audio recordings and medtitations to deepen and anchor the journey of reclaimation for your maiden self. This is a feminine process of soul retrieval which supports calling all unmet, denied, banished aspects that need loving and welcoming back in for wholeness, integration and authentic healing. I craft a unique Clarity Vibration essence blend to hold and support you in the dissolution process, to you give ground and offer a loving container for what ever is needed for you. 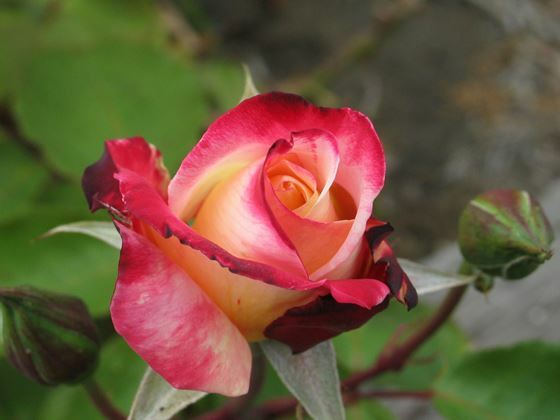 These are bespoke vibrational essences made from flower, plant, light, crystal, environments and are deeply alchemical. We then come together through via skype for the ceremonial process, this is personal to each individual and elements of the journey are woven into the experience for a truly medicinal, soul healing rite of passage, a crossing of a threshold with a full presence and awareness which enables you to access your own reset button. Marking this time with loving awareness with guidance and support gifts you a grounding presence in your life that was previously missing. Many women speak of the ripples and waves of the experience reaching far beyond the moment in time and it truly is a magical reclaimation of the maiden self. It makes such a difference to a woman's life, enabling her to walk forward along her path, surefooted, following the labyrinthine spiral journey of awakening to your power as a woman, as woman who bleeds, as a women who honours her womb wisdom or a woman wishing to bring all the power of her bleeding time into the threshold of Menopause; of holding her wise blood and stepping fully into her power. Do get in touch if you would like to learn more about this one to one process.